FuelFox CEO Ben Morris believes there’s a faster way to gas up. The nation’s first gas station opened in November 1913 at Baum Boulevard and St. Clair Street in Pittsburgh, according to automotive history. Presumably, the restrooms were too dirty to use by early December. Now an onsite fuel-delivery service based in Birmingham hopes to erase the inconveniences and unpleasantry of gas station chores from your life. FuelFox Founder and CEO Ben Morris recently launched the new app for iOS and Android mobile devices to both fleet services and individual memberships. 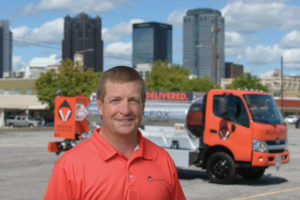 Through the app, users can become registered members of FuelFox to schedule future tank fill-ups at dedicated locations — known as “Fox Spots” — throughout the Birmingham area. The company’s weekly fueling schedules can be found on the app and website. FuelFox services “Fox Spots” on a schedule on the same day and same time each week. Members receive reminder notifications the night before and the day of notifying them that FuelFox will be at their preferred “Fox Spot” that day. Members do not need to be present during service calls. Windshields are cleaned, tire treads and pressure checked, and members are notified of any potential issues with their vehicle. FuelFox members pay a $20 monthly subscription fee, plus the AAA average gas price for the county. The individual membership allows for four fill-ups per month. Family membership fees are $40 per month for up to five individuals on a plan.